Here we are in Flagstaff, Arizona in a parking lot at a large chain store. We were paused here to fill in gaps in our camping supply list while on a road trip to California. 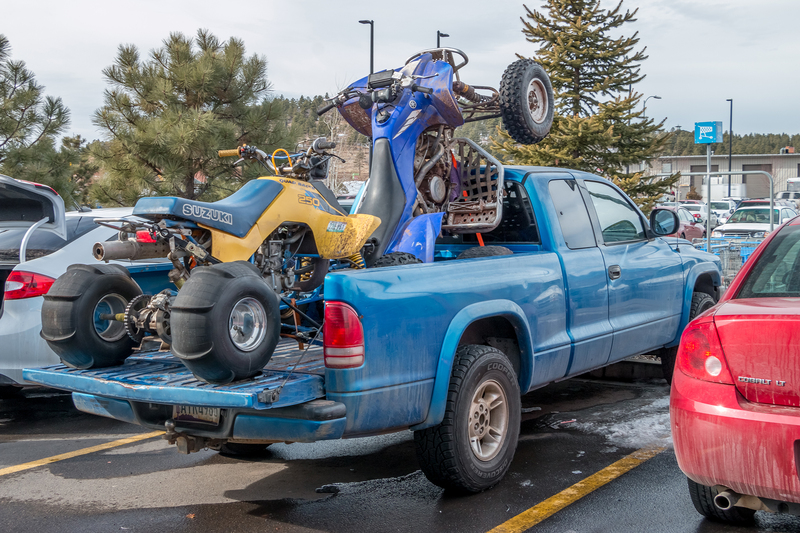 People who live in mountain cabins ride around large open spaces on gas guzzling recreational all terrain vehicles. This is a “slice of life” street photograph from the southwest Mountain state of Arizona, where daylight saving time is not observed. In fact, most of Arizona (except for lands within the Navajo Nation in the north east corner of the state) is one hour behind the rest of the Mountain Time Zone from the second Sunday in March until the first Sunday in November. If you live there, you just know what time it is. When you are driving through, it gets a skosh confusing and you defer to the time being reset automatically on the cellphone when crossing the satellite boundaries.